The end of 2014 brings with it a new resource for the often “hidden” Scouter – merit badge counselors. MBCs tend to escape our notice sometimes because many are not regular Scouters. There’s no requirement that a MBC be registered in a unit. Anyone over the age of eighteen with the requisite experience in the subject matter (and youth protection training, of course) can be a merit badge counselor. Since it’s a no-fee registration, MBCs don’t receive Scouting Magazine unless they subscribe and pay for it, or are registered in a paid position. Now, the Merit Badge Maintenance Task Force, part of the National Advancement Team has begun publication of a quarterly newsletter just for MBCs, The Counselor’s Compass. Check out the very first issue here. Volume 1, Number 1 contains much information of interest, including a brief description of the task force’s mission, a link to training resources, an overview of the Application for Merit Badge (“Blue Card”) and why it’s important that Scouts complete the requirements as written. 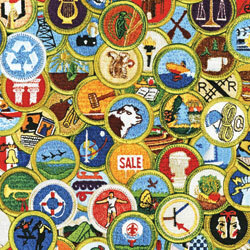 There’s also news on new merit badges and a way to subscribe to the newsletter via e-mail. I can’t imagine that there are any troops that don’t have adults who are merit badge counselors, so please share this new helpful resource with the MBCs in your troop.